Google made streaming video to your TV accessible to many people for the first time with Chromecast, and it’s now doing the same with home audio. At just $35, Chromecast Audio is a no-brainer for anyone who likes music but hasn’t bothered to upgrade to an audio system that can tune into services like Spotify, Pandora or Google Play Music. It can turn pretty much any old pair speakers into a full-fledged connected sound system. Because it works with pretty much any app Google Cast supports – whether it’s on iOS, Android, or the desktop Chrome browser – there’s already a huge swath of services you can use. A variety of apps like Google Play Music and Plex help you import your existing MP3 collection. The two major omissions are Apple Music and Tidal, but you can work around those by using a feature that allows you to cast all audio from your device. The hardware itself is unobtrusive but sleek. It’s shaped like a small, thin puck about the width of a can of soda. Though it’ll stay out of the view most of the time, the vinyl-like grooves on its face are a nice touch. Meanwhile the only cables you’ll need are the included 3.5mm aux cable and the micro USB power cord (which you can also just connect to an available USB port). You can also use a 3.5mm to RCA or optical audio connector if you prefer. Set-up is dead-simple, so even your least tech-saavy of family and friends should need no more than 5-10 minutes to get the system up and running. There are some neat advantages over Bluetooth speakers too. Chromecast pulls in data directly over Wi-Fi, so your incoming calls and text messages won’t come in through your speakers, and you’r free to use other apps with sound. Perhaps the best part is that Google tends to make Chromecast better via software updates. For instance, simultaneous multi-room audio is set to arrive soon via an update. 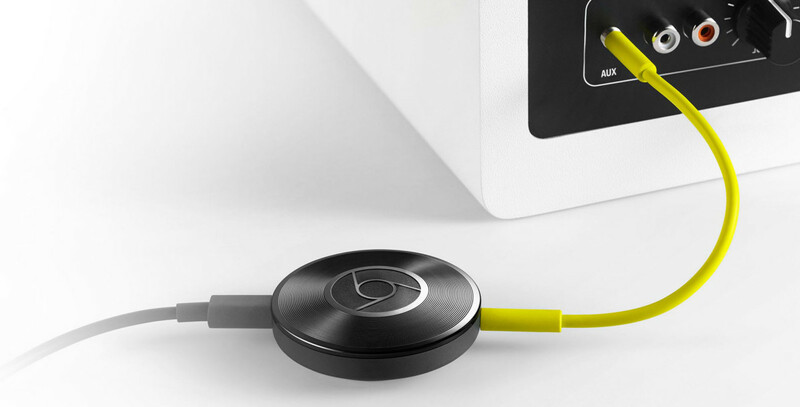 You pretty much can’t go wrong with gifting the Chromecast Audio; at $35, it’s an inexpensive but highly useful gift, and could change the way your friends and family listen to music at home.